When do you bust out the grill for seasonal cooking? Or are you one of the lucky ones that have the ability to grill all year round? It seems like Memorial Day weekend is the time to unofficially grill to our hearts content. This year was no exception and I kicked off the grill season with these Bourbon Baby Back Ribs. 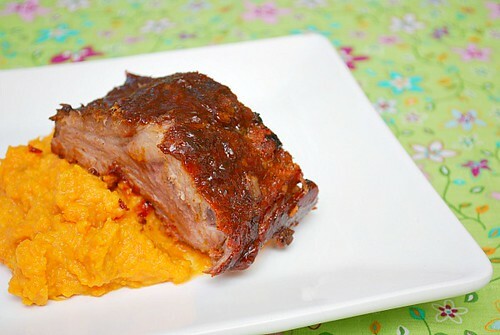 Baby back ribs are rubbed with a combination of spices for the meat to absorb before slow cooking until tender. Just before serving, these baby backs are brushed with a bourbon bbq sauce and grilled to perfection. They're a little sweet and smoky... and finger lickin' good! Cut the racks of ribs in half crosswise. Combine spice rub ingredients in small bowl. Rub each side of racks with 1 tablespoon spice rub; wrap the ribs in foil and refrigerate racks 30 minutes up to overnight. Place the foil wrapped ribs in a slow cooker. Cover and cook on low for 4-6 hours, just until the meat begins to pull away from the ends of the bones and the ribs are just tender. You can slow cook the ribs up to a day before and keep them refrigerated. Bring refrigerated ribs to room temperature about 1 hour before you grill them. Preheat an outdoor grill to medium-high heat. Grill the ribs, brushing them with about half the sauce, until they're crispy and heated through, about 10 minutes. Move the ribs around as they grill, the sugar in barbecue sauce makes it easy for them to burn. Let the ribs rest for 5 to 10 minutes before cutting them into 1 or 2-bone pieces. Put out the rest of the sauce for dipping or brush it over the ribs. Stir all ingredients together in a small bowl until sugar is dissolved. The sauce will keep in the refrigerator for up to 2 weeks. Not sure if I am fortunate or not, but i do grill and smoke all year... pretty much 20 degrees is my cut off. My wife has funny shots of me standing knees deep in snow waiting for the right grill marks on my steak. It's an addiction. I just made a bourbon sauce for some grilled chicken wings... should have thought to save some for ribs. Looks great as always and they sound delicious! Oh my. I've gotta try this!